Building on 25 years of innovation and sales leadership, the 2016 Ford Explorer is on its way, with even more smart technology, a new 2.3-liter EcoBoost® engine and an all-new Platinum series. The new Ford Explorer goes on sale next summer. The new Explorer, revealed today at the 2014 Los Angeles Auto Show, builds on the strength and leadership of Ford’s new vehicle lineup – the freshest in the industry – and provides SUV customers even more versatility, capability, smart technology and efficiency. Introduced as a 1991 model, Explorer featured generous interior space customers were looking for, and was engineered specifically for people seeking adventure for their families and a way to express their individuality. For a quarter century, Explorer has been America’s best-selling SUV. Capability – that’s what customers will get even more of with the new Explorer, thanks to an available 2.3-liter EcoBoost four-cylinder engine delivering at least 270 horsepower and at least 300 lb.-ft. of torque. The 2.3-liter EcoBoost replaces the 2.0-liter EcoBoost four-cylinder available for the current model. The 2.3-liter EcoBoost is available on the base, XLT and Limited series. The new powerplant is expected to give customers 12.5 percent more horsepower and 11 percent more torque over the current 2.0-liter EcoBoost engine. It improves highway passing times 10 percent at speeds between 55 mph and 75 mph. The 2.3-liter EcoBoost will deliver a noticeable improvement in horsepower and torque; while EPA results are not yet certified, no sacrifice in overall fuel efficiency is anticipated. The current Explorer is a gas mileage leader on the highway. The 2.3-liter EcoBoost benefits from technology that makes it more efficient and optimizes performance. It employs an active oil control system to optimize pressure when less fluid is needed. An active wastegate controls boost more precisely during light load operation to help save fuel. A higher compression ratio results in more efficient fuel combustion. The standard 3.5-liter V6 engine for base, XLT and Limited models – with an estimated 290 horsepower and estimated 255 lb.-ft. of torque – is paired with a six-speed SelectShift® Automatic transmission. Explorer Sport and the Platinum edition get a standard 3.5-liter EcoBoost V6 with an estimated 365 horsepower and estimated 350 lb.-ft. of torque – also mated with a six-speed SelectShift Automatic. Style – the all-new Platinum series further elevates the full-size SUV in look and feel, with changes to both the Explorer exterior and interior. From new multicontour front seats wrapped in Nirvana leather with micro-perforation, to special quilted stitching used throughout, to advanced standard technologies, Platinum elevates Explorer in ways customers can see and feel. The interior incorporates brushed aluminum and satin-finished ash wood in multi-piece appliqués on all door panels and the instrument panel. The wood-trimmed, leather-wrapped and heated steering wheel includes unique stitching that matches the stitching used throughout the interior. For the first time in a production Ford vehicle, a brushed aluminum Ford oval is centered on the steering wheel. Nirvana leather wraps the instrument panel, console armrests, quilted door bolsters and upper door trim. 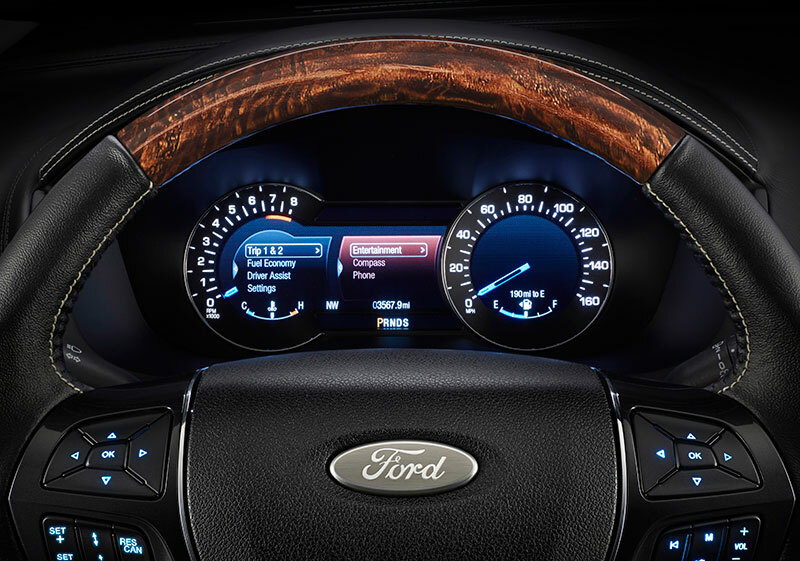 The instrument cluster features a large 10-inch digital display supported with analog displays – a first for a Ford-brand vehicle. The new Explorer Platinum will be the first Ford vehicle to get an all-new 500-watt Sony Audio System with Live Acoustics and Clear Phase technology. 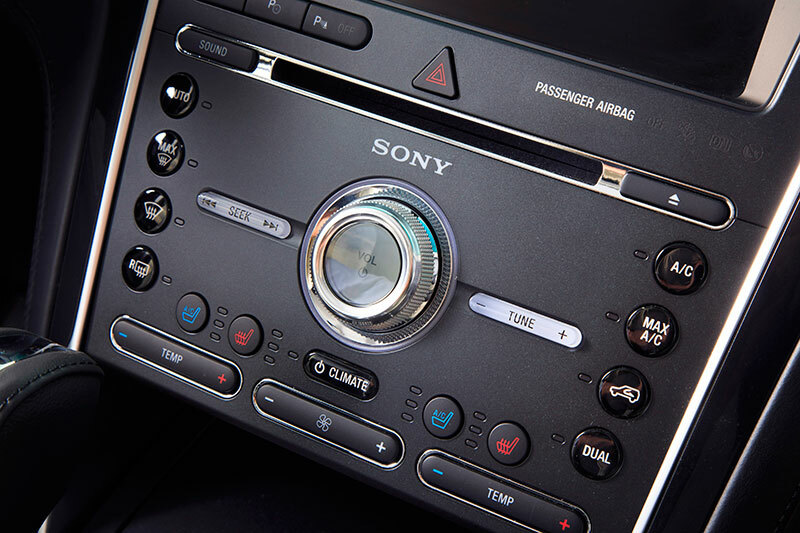 Clear Phase eliminates sound dispersion throughout the vehicle, so the music occupants hear is precisely pinpointed, just as the artist intended. Live Acoustics engineering re-creates the sound dynamics of some of the world’s greatest concert halls for a more enveloping, realistic sound. Explorer Platinum also gets standard advanced technology features including enhanced active park assist, lane-keeping system and rain-sensing wipers. For the exterior, signature lighting surrounds the LED headlamps, giving Explorer Platinum a continuous glow. Other features include a standard dual-panel moonroof, premium silver-painted front and rear skid plate elements, and 20-inch wheels with bright machine face and tarnished dark painted pockets. The integrated exhaust is designed to reduce the appearance of soot collecting at the rear of the vehicle. Inside the chrome bezel of the exhaust, engineers designed a shield that catches the soot so it doesn’t collect around the outlets. Explorer’s intelligent four-wheel drive with Terrain Management System™ reassesses conditions about 20 times faster than the blink of an eye, providing precise handling and traction. 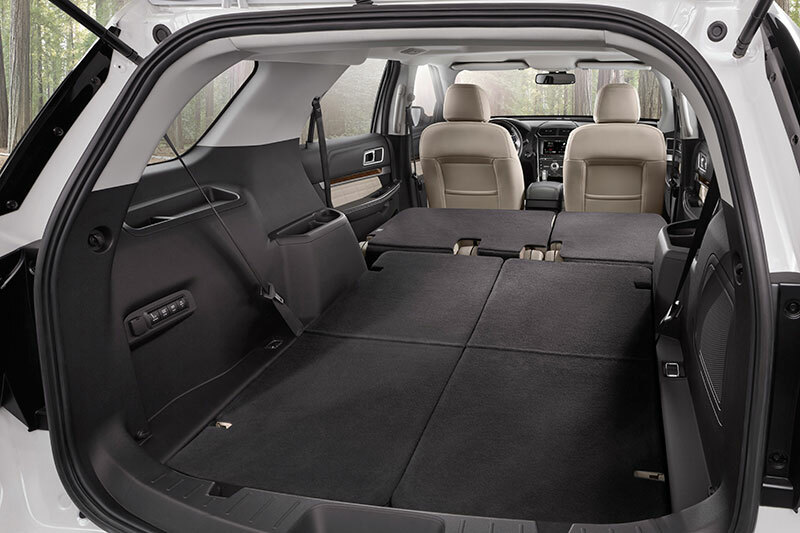 To help maintain efficiency, in most steady-state cruising conditions the new Explorer equipped with intelligent four-wheel drive seamlessly and quickly transfers torque between the front and rear wheels. A newly refined, intelligent four-wheel-drive gauge display shows power being distributed to front and rear wheels under all conditions – from heavy four-wheel-drive system usage to when the system is not transmitting power at all – for improved efficiency. For added convenience, the Terrain Management System automatically defaults to normal mode whenever the vehicle is started to ensure it is ready for normal driving conditions. Using a dial located on the center console, the customer can shift on the fly, selecting one of four terrain management modes – normal, snow, sand or mud – to set how the engine, transmission, brakes and four-wheel-drive system will operate. A fifth setting is for navigating hills. Ford completely retuned the Explorer chassis to clearly differentiate the driving experiences of XLT, Explorer Sport and Platinum models. The suspension uses MacPherson construction with an isolated subframe and 32-millimeter stabilizer bar at the front, while an independent multilink rear setup uses a 22-millimeter stabilizer bar. Explorer Sport customers looking for a more dynamic driving experience will benefit from a unique steering gear, front and rear springs, struts and rear dampers. The new Explorer, with standard 18-inch and available 20-inch wheels, offers new tire options for improved ride and handling, while reducing road noise in the cabin. Interior changes help enhance quietness in the cabin. There are new door seals, and an enhanced sound package includes engine subframe mounts specially tuned to reduce vibration, as well as a specially tuned exhaust for the 2.3-liter EcoBoost engine. Acoustic glass is used on the windshield and front doors on XLT and higher trim levels. 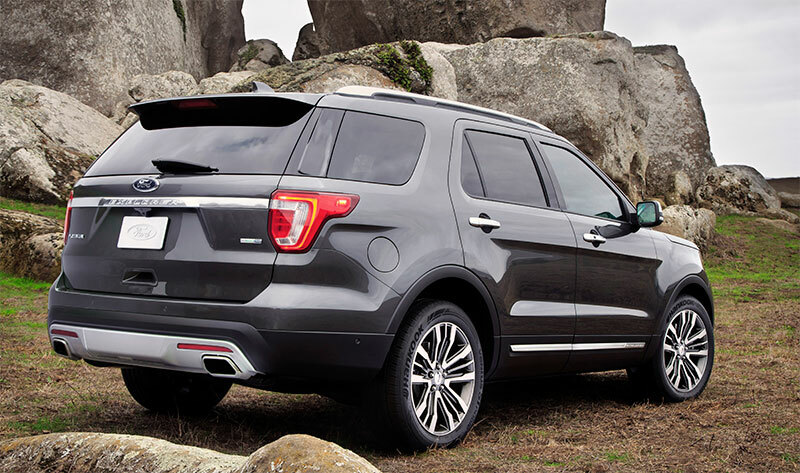 Rugged – that’s the word that inspired the designers creating the look of the new Ford Explorer. Exterior style updates – such as positioning the grille and LED headlamps even higher, adding a new closed-off lower roof rack with channels that cascade rainwater off the vehicle and a new rear spoiler – also improve aerodynamics. Explorer features more robust headlamps, with available LED signature lighting, standard LED low-beams and available LED fog lamps. Visible heat-sink structures for cooling the LED headlamps are a meaningful detail. These radiator-like grilles are typically hidden behind the light cluster, but on Explorer they are part of a complex headlamp design that puts innovation on display. 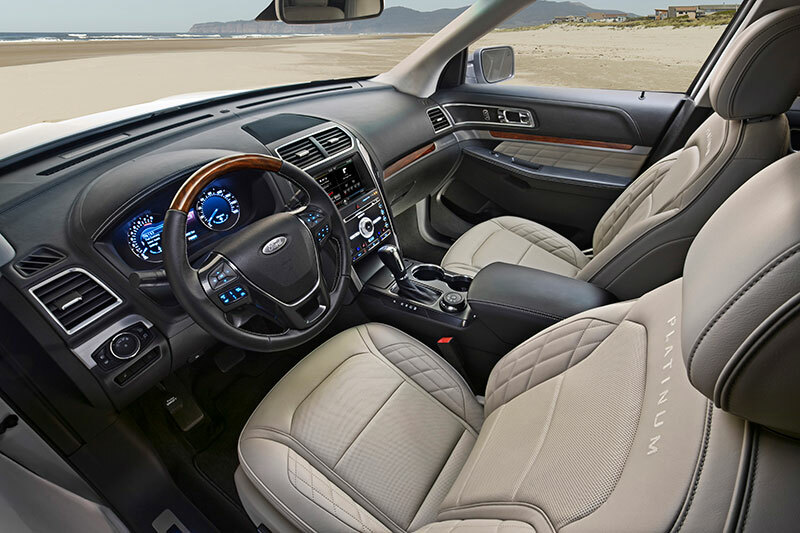 Interior design changes reflect desires customers expressed through Ford consumer research, which shows one in five Explorer Sport customers previously owned a luxury vehicle. Changes include a higher wrapped and stitched door armrest, real buttons to replace touch-sense buttons on the infotainment system and more refined detailing throughout.